If you like Bollywood movies, you must see this. Beautiful women, handsome men, great music and good choreography. Julie and Julia – a biographical movie based on the book by Julie Powell, “Julie and Julia: 365 days, 524 recipes, 1 Tiny Apartment Kitchen”. 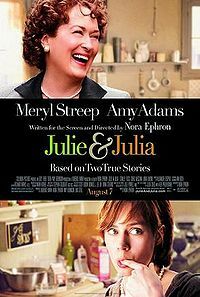 Presents life of the American cook Julia Child (Meryl Streep) and Julie Powell, a young writer trapped in a rather unpleasant job at the Lower Manhattan Development Corporation’s call center (Amy Adams) who decides to change her life and prepare all 524 dishes from the book Julia Child in one year. I recommend this movie, because it shows that much depends on us, that we can dream and realize those dreams, gives hope that we too will succeed.